One of the University’s most beloved teachers and scholars winning the HKU Outstanding Teaching Award in 2011, and a leading figure in Hong Kong cultural studies. She also pioneered the filmmaker-in-residence scheme, which was first set up in the Department of Comparative Literature and later adopted by the University as the University Artists Scheme. 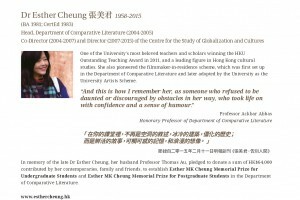 In memory of the late Dr Esther Cheung, her husband Professor Thomas Au, pledged to donate a sum of HK$64,000 contributed by her contemporaries, family and friends, to establishEsther MK Cheung Memorial Prize for Undergraduate Students andEsther MK Cheung Memorial Prize for Postgraduate Students in the Department of Comparative Literature.